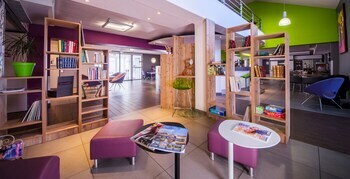 With a stay at ibis Styles Brive Ouest in Brive-la-Gaillarde, you'll be within a 15-minute drive of Centre National d'Etudes Edmond Michelet and Church of St-Martin. Featured amenities include a computer station, complimentary newspapers in the lobby, and a 24-hour front desk. Planning an event in Brive-la-Gaillarde? This hotel has facilities measuring 646 square feet (60 square meters), including meeting rooms. Free self parking is available onsite. With a stay at Chalet Hôtel d'Ailefroide in Ailefroide, you'll be in a national park, within a 10-minute drive of Ecrins National Park and Mont Pelvoux. When you stay at this apartment in Saint-Palais-sur-Mer, you'll be by the sea, within a 15-minute drive of Royan Church of Notre-Dame and Royan Beach.